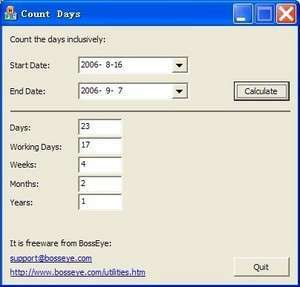 When you want to find out how many days there are between two dates, or find out how many working days there are before a specific day, you can use CountDays to get these information to count the days. It provides how many days, working days, weeks, months, and years between two days. Count days, count working days, count weeks, count months, and count years. CountDays allow user select the start date and the ending date, and then it will count the days, weeks, months, and years. For security reasons, you should also check out the Count Days download at LO4D.com which includes virus and malware tests. Additional screenshots of this application download may be available, too. Count Days has a presence on social networks.